Amazing, sir! I can't imagine how challenging this is. Wow! What a way to introduce yourself. I don't know enough to comment on historical accuracy but what I will say is that this looks absolutely brilliant and I can't want to see the finished model. Very impressive undertaking! Looks like you've been working for a while too. Is this going to be a historic ship like USS pennsylvania? If so you've got a one of a kind project there but are going to need another deck or two to make it a proper first rate. I think the smallest US first rate was rated at 104 guns so this will be HUGE The head rail design looks good in white, about the only criticism I have at this point is the gunports look a little small for the size of the ship. On a side note you will deffinately have to resize your pictures, maximum is 800x600 I believe. Keep up the good work! wha..bu..how I am completely lost for words this truely is amazing. ITS HUGE!! On a side note you will deffinately have to resize your pictures, maximum is 800x600 I believe. Indeed. Please resize as soon as possible. Links to tutorials are in my signature. I'll give some decent feedback later, as there is simply so much to comment on. Holy S***! That is the mother of MOC ships! I think you need and 18-wheeler lowboy just to move it! Wow, just WOW! 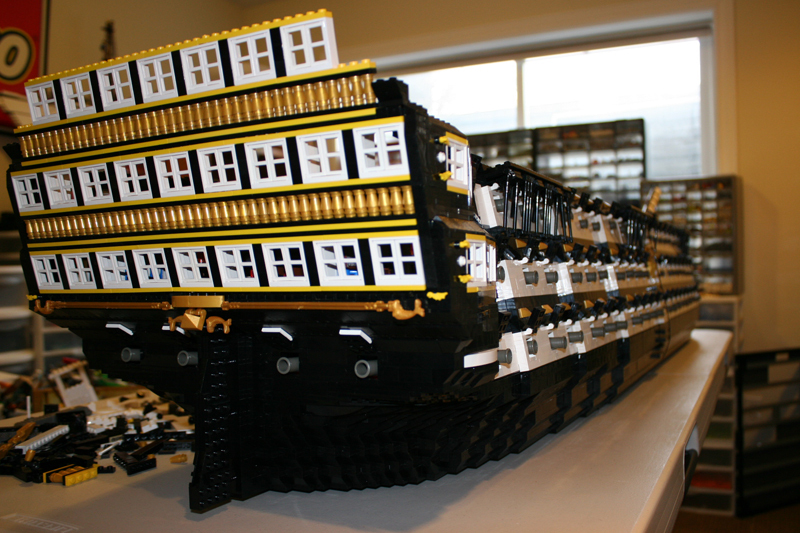 I've never seen a Lego ship that large. Fantastic! It's Inconceivable!!! I love it, great way to introduce yourself! Makes me wonder, is it BIGGER than minifig-scale? That's pretty big! I can't wait to see it finished. That nails it - I don't know whether I should find this to be an act of sheer crazyness, something completeley amazing or something to adore unconditionally - I think I'll go with all three options. Amazing! That's gonna be a monster ship! Wow, very impressive! Would the bow spirit mast be that large in diameter? This is fantastic. It is so huge with its brick built hull. You should be proud. This is an amazing accomplishment! I can’t wait to see the finished model. Thanks for resizing. I will pay attention to that with future picture posts. This is not a copy of any historic ship, but it should be obvious that that the HMS victory has been a source of much inspiration. It will have three gun decks. Estimating 150 guns. Gunports were a compromise. Go one brick larger and they are way too big and the ports look odd in my opinion. 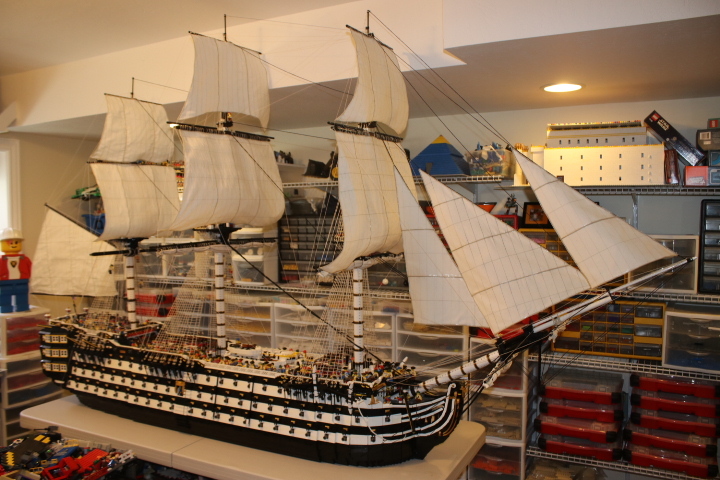 Size was initially scaled to HMS victory. I took a lot of effort in the scaling using various scaling resources for minifig scale on the internet. However, upon scaling and laying out the hull, I decided to go about ten inches longer to up the anti a little. She looks great- it's nice to see some mid- 19th century ships sometimes. Also, you seem to be a builder who knows what they're doing- can't to see the end product! Is that a powder magazine down on the orlop that I see? To keep it round, I think the best match for the Bowsprit width and initial length is the blocks selected. I was actually surprised at the diameter of the bowsprit. It was massive on ships of this size. Further lengths will be much smaller in diameter but on a ship of this size, it will extend out several feet further. Orlop is fully built out with brig, sick bay, anchor line hold and anchor line, pursuer's store, carpenter's store and work area, massive storage area, a few officer quarters, and a powder magazine with glass walls and exterior lamps as in the real ship. I had to compromise a little to combine the hold and the orlop deck, so most of the typical officer quarters in this deck went away. In the picture, you are looking at the brig on the left and surgeon at work on the right. I'll add some more pictures in the future. This is incredible! I love when people build American ships! The size sure is very impressive, but I can already count 22 guns on the lower gundeck; on each side! If you give just a tiny bit of attention to historical accuracy you should reduce this to 16 at most. After all the gun count is one of the most important characteristic of a ship of the line. 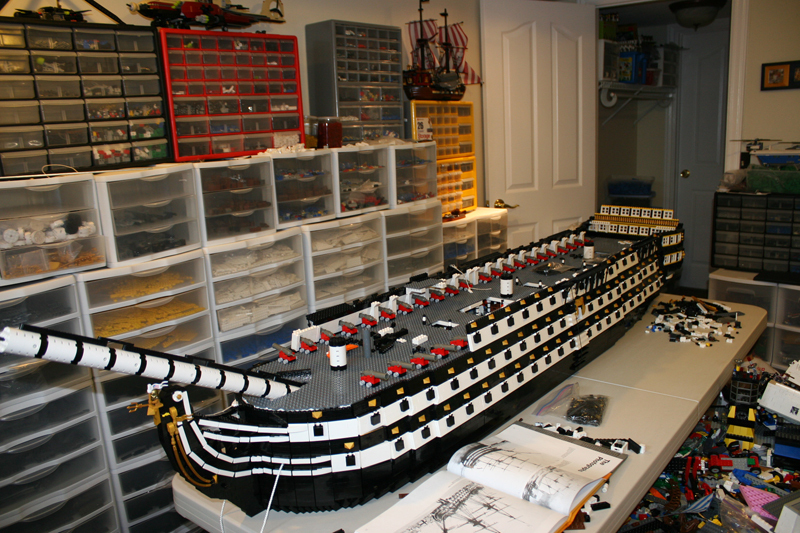 Building a 1st rate with 44 guns on each deck is about as accurate as building one with 4 masts if you know what I mean. Personally I found 3-wide gunports the most accurate, the Lego cannons are a bit too short for minifigure scale (but come pretty close to carronades). How are you planning to ensure structural integrity? After all this is one of the toughest challenges for minifigure scale ships. Any ideas concerning modularity? Still, it's great to see one more minifigure scale ship in the works, this is the eye candy pretty much everybody on this forum is looking for. I'm very much looking forward to updates. Keep it up! An incredibly ambitious project!!! I agree about possibly cutting a bit of length on her. One way to simplfy this and have both variations would be to make it in sections as mentioned. This way mobility would be easier and also you can have a removable cross section which you could either keep in the ship for your go bigger idea, or remove at will. As long as the mounting points line up. Maybe two removable cross sections to keep the masts in proper alignment. 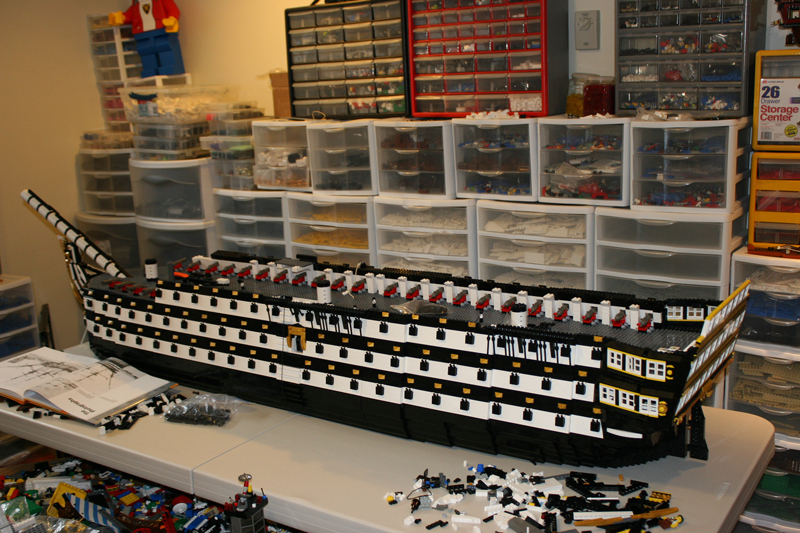 It's great to see an American ship of the line being created. I always admired the photo I have already seen posted in this thread of the U.S.S. Pennsylvania. Its a shame that we had her torched after "worrying," about capture. I just hope you will be putting sails on this beast eventually. Can't imagine how big they will be! I also agree about the cannons and feel a custom approach would be more realistic for a ship of this size, likely less expensive as well. Keep up the good work and can't wait to see how you design the stern! On a last note when I was creating my little "dingy, compared to this!" I posted several pictures of the creation process and took many comments into consideration. Without the help of these boards it likely would have turned out vastly different and not nearly as pleasing. After all, MOC's are one of the main reasons why I'm sure so many people are here. As stated before and i think they may have been missed, please re-size your pictures to a maximum of 800x600.